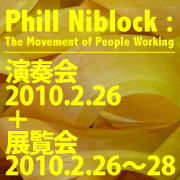 Live Performance + Exhibition by Phill Niblock. The Movement of People Working, his film series, has been paused since 1991, after a few decades, he did a video-shooting at factories and market in Osaka, November 2009. Don't miss his live performance and Exhibition. Phill Niblock is a New York-based minimalist composer and multi-media musician and director of Experimental Intermedia, a foundation born in the flames of 1968's barricade-hopping. He has been a maverick presence on the fringes of the avant garde ever since. In the history books Niblock is the forgotten Minimalist. That's as maybe: no one ever said the history books were infallible anyway. Since 1968 Phill has also put on over 1000 concerts in his loft space, including Ryoji Ikeda, Zbigniew Karkowski, Jim O'Rourke. The Installation of old film and sound related to family of the artist, Hiroshi Miyamoto. to home. Please bring a portable FM radio you have (if you have). - It could do because you find the common thing with those photographs. This project is composed of installation works about The Miyamoto Family and their stories. I interweave my film, photographs and sound are interwoven with the home movies and the family albums recorded by my late grandfather Toshikazu into a work of art. In those records, both of us capture the people close to ourselves and landscapes around our house. That is to say, the memories of the family are recorded. _ you might realize something taken for granted, but something important through our work. Atsushi Suzuki, living in Kitakyushu, Fukuoka presents the video series entitled "so what?" including 300 short pieces, as well as his new works“8 Landscapes of Osaka”. The "so what?" video series consists of simple short pieces Suzuki captures from ordinary landscapes and scenes in daily life. These seemingly casual video works are filled with humour, comicality, melancholy, loneliness and beauty hidden in human behavior and nature Suzuki pursues. Suzuki's worldview will give us the opportunity to rediscover the world and to have diverse viewpoints through “so what?” series. We strongly recommend people who are not so keen on video art. Once you see, you cannot take eyes off Suzuki's worldview represented in his humane works! Screening Matsui's past video works, including her latest work. The MEM Gallery also exhibits her drawings from 2000 to 2006 between 17 April to 17 May. programmes. The last programme selected 2 Japanese artists- Ayako Yoshimura and palla (Kazuhiko Kawahara). Yoshimura is currently living in Amsterdam NL. In her video work "place - a city"
Besides, large-scale photographic work is exhibited in the remo space. Cityscapes on their perspective could be a "contemporaty landscape paintings" in the mixture of beauty and distortion existing in our living cities. The genius artists representing Osaka, Rogues' Gallery is also known as a enthuasitic video collector in the corner of the globe. Rogues” Gallery and remo have launched a project, Bar*DaVide in remo once a month since July 2006. With the axis of their collection- the open-wide, deep, dazzling world of moving image is explored in this video studies-café project. In November, Bar*DaVide will show up in the project presented by HOTEL T’POINT, located in the centre of Osaka- Shinsaibashi. Fulfill your brain with the DaVid-ish ways of enjoying moving image! In New Visionaries, 2 up-and coming artists; Fuzitama and Chikara Matsumoto. It exhibits Fujitama's past series "kazoku no yume oukoku(Family Dream Kingdom)" and Matsumoto's video works with music by Organo lounge and original copy of his animation, as well as his invented film machine. On the 3rd February, the collaboration event is scheduled. Cafe Millet will serve some light meal! Don't miss it! *the artists' collaboration event is scheduled on 3rd February! There might be a new discovery in places you casually pass by, and scenes you tend to miss by clipping out moving image. In this workshop, we call for submissions of video works from the public in accordance with The Lumiere Rule, 6 possible techniques in 1895 when the Lumiere brothers invented Cinematograph. In addition to the screening of submitted works, we have a discussion on reconsidering the role, the potentials of moving image as a medium lying in everyday life and the grammar of moving image. 6 artists made one minute video works in accordance with The Lumiere Rule, 6 possible techniques in 1895 when the Lumiere brothers invented Cinematograph. See what we, viewers rediscover in daily life, landscapes of living things on earth in moving image clipped from the artists' perspectives? So far, remo had screenings, lectures, workshops and gatherings to reconsider a variety of what we call, 'post-movie'in project"New Visionaries". remo_showcase review works we encountered in our past events and activities to look for the future applications of post-movie. 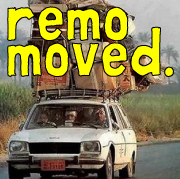 remo selects moving images from various perspectives from our programmes; remember 3rd Monday, video lounge'wallstream', mobile vision (movie shot by mobile phone). See www.remoscope.net for the rules. Move on Asia, an animation and single-channel video art exhibition, that took place in Seoul, South Korea in May 2004 will be embarking on a tour of Aichi [+Gallery], Osaka[remo], and Tokyo[Tokyo Wonder Site] in Japan. In Seoul, 45 video works from all over Asia were exhibited on evenly spaced monitors, as though it were one big installation work. Throughout this exhibition, there is one common stream behind all works created by different artists - 'contemporary'. Some video works are generated from ever-expanding technologies, whereas, others used drawing giving us fresh impressions. Also, the 2nd In-Between International Conference on Globalism and Alternative spaces accompanied the Move on Asia. That encounter in Seoul interwove meshes of a worldwide network, which enables us to introduce a variety of works by emerging Asian artists in Japan. We believe Move on Asia will be an initiative that enhances a solid and wide network. - 'Admiring La Argentina' 1977/70min. Between 24th to 28th, photography, posters, and his costumes trace Kazuo Ohno's Butoh history are exhibited beside the screening of excerpt from "o kind god" and private film. Exhibition by Yuuki Matsuda and Keita Sakai. The exhibition by the French artist, Boris Achour, who is staying in Osaka for artist-in-residence- The 14th ART-EX. During his stay, he had a series of workshops with 5 Japanese dancers to examine "the relation between motion of body and the space in a shopping mall" They actually had their performance in a shopping mall for video installation work. remo is a non-profit organisation whose activities focus on three main areas; knowledge; expression; and interaction via media. Remo aims to promote activities related to media art, to promote the use of moving image as a tool and to create a platform for people to meet and discuss the moving image in all its forms.